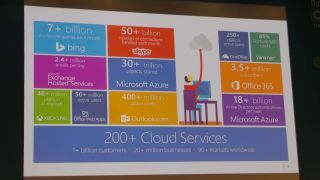 This is Microsoft's cloud on a slide. One slide at the presentation of Kushagra Vaid, GM, Server Engineering, Cloud+Enterprise Division at Microsoft resumed beautifully the extent of Microsoft's clout in cloud. Vaid was a keynote speaker at the DCD event in CeBIT 2015 in Hannnover and was particularly candid and open about what the company learnt since starting doing business on cloud. The company currently offers more than 200 cloud services in more than 90 countries worldwide. It serves more than a billion customers and a whopping 20 million businesses. Some of the numbers were already in the public domain but it was refreshing to get them all combined on one slide. There are more than 400 million active users on Outlook.com, more than 3.5 million subscribers to Office 365, more than 250 million active OneDrive users and a staggering 50+ million active users of Office Web Apps. These numbers however pale in comparison with the 30 trillion objects currently stored in Azure or the one trillion expected annual Active Directory authentications on the same platform. Microsoft has more than one million production servers scattered around the globe with 15 major data centres. All data is triplicated by Microsoft to ensure that none is lost in the event of outages. Customers can also request data to be double-triplicated across primary and secondary regions to maximise redundancy.